A babe is born in the shadows of the ravine city, a child who will end the self-imposed exile of the dwarves and usher in a new age of glory. Years later, Ravine Guard Carnac Thayn discovers a break-in at the Scriptorium. 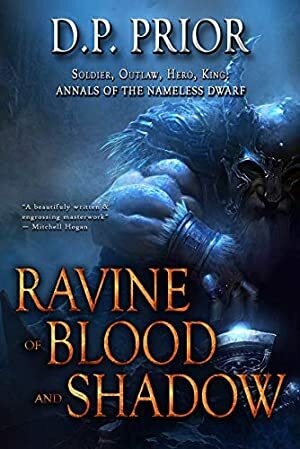 A dwarf has been murdered and a book stolen, but the ruling council do nothing. Then, when Carn is called to investigate thuds and crashes from the mines, old horror rises from the deep, and the city is threatened with slaughter. Rumors begin to circulate about a mythical axe said to be lost below the earth, an axe wielded by the dwarf lords of old that might just be the last hope of a race marked to die. But deception is rife, and unseen forces manipulate all paths to the future. It is a pivotal moment for the dwarves, and Carn must make a choice that will either save or damn his people. Blood will flow in rivers through the ravine. Friends will become foes. A name will be forgotten. Log In to track D.P. Prior on eReaderIQ. to be notified each time the price drops on any book by D.P. Prior. to stop tracking D.P. Prior. Log In to track Valmore Daniels on eReaderIQ. to be notified each time the price drops on any book by Valmore Daniels. to stop tracking Valmore Daniels. Log In to track Anton Kokarev on eReaderIQ. to be notified each time the price drops on any book by Anton Kokarev. to stop tracking Anton Kokarev. Log In to track Greg Shipp on eReaderIQ. to be notified each time the price drops on any book by Greg Shipp. to stop tracking Greg Shipp. We started tracking this book on March 9, 2016. The price of this book has changed 41 times in the past 1,140 days. The current price of this book is $2.99 last checked 3 hours ago. The lowest price to date was FREE last reached on April 12, 2019. The highest price to date was $9.99 last reached on August 19, 2018. This book has been $9.99 8 times since we started tracking it. We last verified the price of this book about 3 hours ago. At that time, the price was $2.99. This price is subject to change. The price displayed on the Amazon.com website at the time of purchase is the price you will pay for this book. Please confirm the price before making any purchases.